Ramsons have long leaves with parallel venation; up to 45 to 50 cm long but they are also broad. They tend to 'flop' or bend over at their broadest point. The leaves are not dis-similar to those of lily of the valley, but they are a brighter green and have a distinctive smell. (Note : the leaves of Lily of the Valley are toxic). Ramsons are perennials and the leaves form bulbous underground structures. 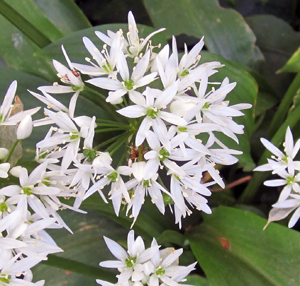 Ramsons have bright, white, "star-like" flowers that form in clusters on a spike (called an umbel) of 15 to 20 flowers. The outer ring of petals are, in fact, sepals – petals and sepals are basically indistinguishable. When petals and sepals are like this, they are sometimes called tepals. Each flower has 3 sepals and 3 petals - giving a 'ring' of six white tepals. As the flowers buds develop, they form inside a thin papery case or bract. These flowers / umbels are supported by stems that are roughly triangular in cross section. 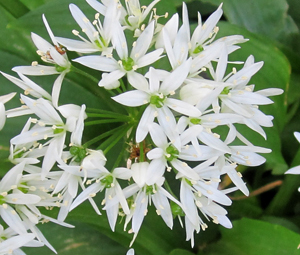 There are other species of wild garlic – such as Crow Garlic (Allium vineale). This has pinkish / green flowers that are (sometimes) mixed with small bulbils instead of some of the flowers. Indeed, occasionally the flowers may be replaced completely by bulbils. In Crow Garlic, the stamens stick out from the flower. It is an introduced species, as is the three cornered leek - Allium triquetum. This has thinner leaves than those seen in Ramsons, and the leaves are ‘keeled’. 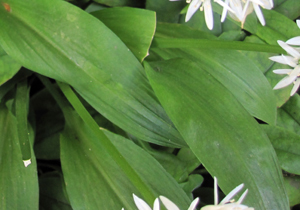 The flowers are white like those of Ramsons but have a distinguishing green line on the back of the petals. Sometimes referred to as the "white bluebell"
There are several species of plants to be found in woodlands and hedgerows that give off the distinctive smell of onion or garlic when bruised or trampled upon. They are all species of Allium – plants that belong to the same family as Bluebells – the Liliaceae *. It is likely that they contain the same chemicals as give Garlic its odour - Allicin and Diallyl Sulphide. These are sulphur containing compounds formed from the amino acid, cysteine. Such compounds probably act as a defence against pests. 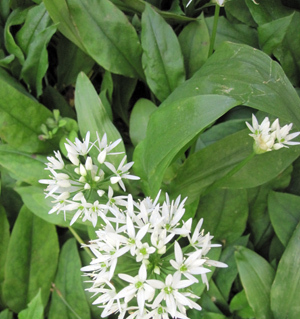 The most common form of wild garlic is the Ramsons or Allium ursinum. This is a native form of wild garlic. Ramsons tend to be found in damp soils in woods or on shady, moist banks. * The Lily family (the Liliaceae) has floral parts arranged in threes, usually there are 3 petals and 3 sepals. These are often similar, so the flower appears have 6 petals. The leaves have parallel venation and are undivided. The Lily family includes Leeks, Bluebells, Solomon’s Seal and Wild Asparagus.